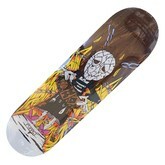 *If you would like FREE black griptape with this deck, check the box below. Or, you can purchase other griptape options seperately. Free black griptape selection will show in the comments of your order, at checkout. *Hint: Add this product to your cart first, then click the button below to select from all of our griptape options.